Video clip synopsis – The disappearance of our seventeenth Prime Minister, Harold Holt, during a beach holiday sparked countless conspiracy theories. The items left in his briefcase are a significant time capsule of his last days as Prime Minister. Broadband MP4 holt_bb.mp4 (19.1MB), suitable for iPods and computer downloads. 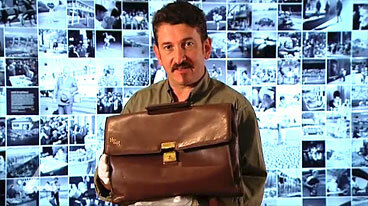 Harold Holt’s Briefcase is an episode from the series The Prime Ministers’ National Treasures, produced in 2007. The disappearance of our seventeenth Prime Minister, Harold Holt, at Cheviot Beach in 1967 during a beach holiday sparked countless conspiracy theories and ultimately overshadowed his political accomplishments. At the height of the Cold War, with the Vietnam War escalating, Holt moved Australia’s focus away from Britain and more towards America — substantially increasing Australia’s involvement in the Vietnam War. His impromptu speech on the White House lawn declaring himself ‘All the way with LBJ’ indicated his support for US President Johnson. Holt’s prime ministership represented a major social shift from the tradition and conservatism of the Menzies era, to that of the ‘swinging sixties’. One of the hardest working of Australia’s Cabinet ministers, after 32 years as a parliamentarian, Harold Holt reached the prime ministerial office in 1966. Holt’s first prime ministerial statement announced the relaxation of restrictions that had blocked the entry of non-European migrants for 65 years. The Migration Act 1966 increased access to migrants other than those from Europe, including refugees fleeing Vietnam. This was the beginning of the dismantling of the 'White Australia’ Policy. In 1966 he brought in Australia’s conversion to decimal currency. The following year on 27 May 1967 Australians overwhelmingly answered ‘yes’ to removing the discriminatory clause in Australia’s Constitution under which Aboriginal people were not counted in the census, and in changing the Constitution so that the Commonwealth parliament was empowered to legislate for Indigenous people. Holt also brought Australia into the ‘space race’ with the construction of the Honeysuckle Creek Tracking Station, and the joint US-Australian communications station at North West Cape, Western Australia. In September 2005, the Victorian State Coroner found that Holt had drowned while swimming. The Coroner had previously been unable to investigate a death where a body was never found. Harold Holt was the third prime minister to die in office after Joe Lyons (1939) and John Curtin (1945). The items left in Holt’s briefcase are a significant time capsule of his last days as Prime Minister: a pair of socks, theatre tickets, his tax returns and a couple of combs. Harold Holt (1908 – 1967) was Prime Minister of Australia from January 1966 to December 1967. Harold Holt’s briefcase is held at the National Archives of Australia in Canberra.